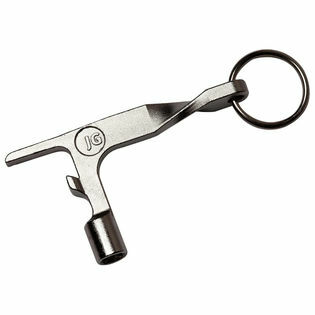 The JGpercussion BottleKey is a drum key that is also a bottle opener and a keychain. This drumkey is made from stainless steel for durability, and it's pocket sized so that drummers will carry it around wherever they go. Each one comes with a key ring attached. The JG BottleKey measures 3″ long and 1.75″ tall. The JG BottleKey is here ! A bottle opener - drum key - and keychain all in one. Made from stainless steel for durability, the JG BottleKey has an ergonomic shape and fits easily in your pocket. Here's to parking lot parties after gigs. I'm ready guys. My god, where can I even hope to find the words to express my love for this item. I haven't used it to change any heads yet, but I've been looking for a keychain bottle-opener for a while now, and this is about the greatest thing I could have possibly found. It works perfectly, is no bigger than a standard drum key, and is made of durable metal. About as heavy as you'd expect, not too bad. For the price, this is a must-buy. I've been using it nonstop; it's just so easy to feed my addiction now that I can open a bottle at any given moment! Truly a godsend. Elegant, simple, bombproof. Tune your snare, adjust your hardware, open your favorite microbrew. A perfect little gizmo that goes with me everywhere. With this in your pocket, and a speed key and a Leatherman multitool in your drum bag, you'll be ready on the road and at any gig. As a drummer, you always need to carry around a drum key. With this product, you don't need to worry about bringing a bottle opener. Great product idea from JG. This is easily the greatest drum key on the market. I'm so glad JG Percussion finally came up with this idea. What's more perfect than having a drum key and a bottle opener all in one? You can use it to tune up your drums before the show and get a drink with your friends afterwards. It's extremely convenient, and it also comes with a keychain. It's definitely an ideal purchase for any drummer or percussionist.